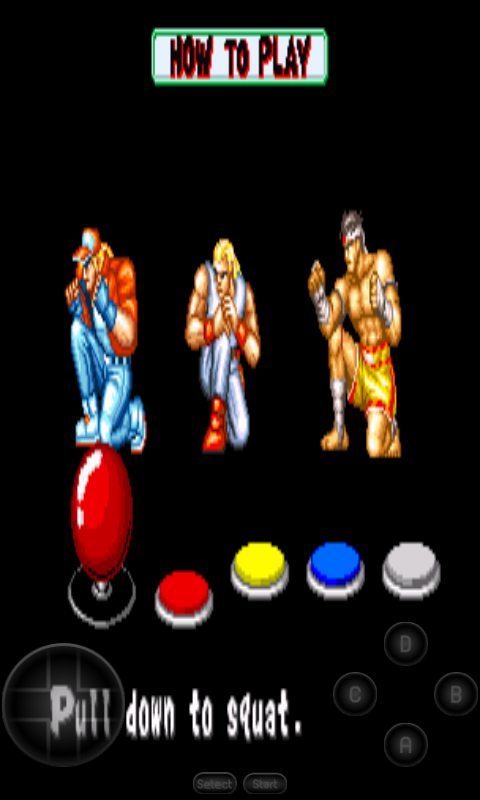 Play Fatal fury Games in Computer and Android for free. 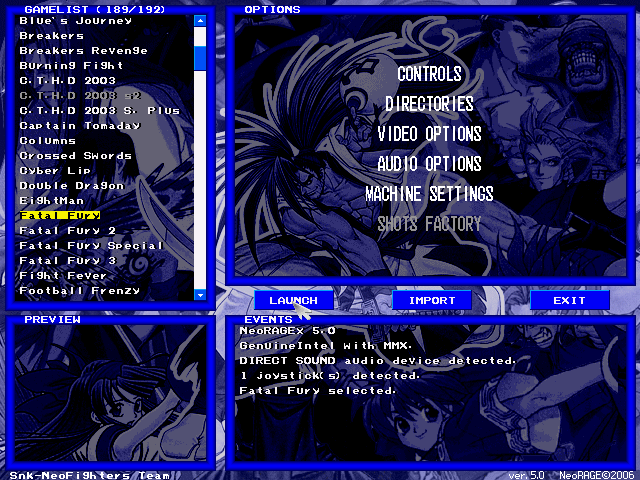 It is a Old Neo Geo Emulator Game. It is Multiplayer Games, So you can play with your Friend and enjoy together. Just follow some instruction to play in Computer and Android. 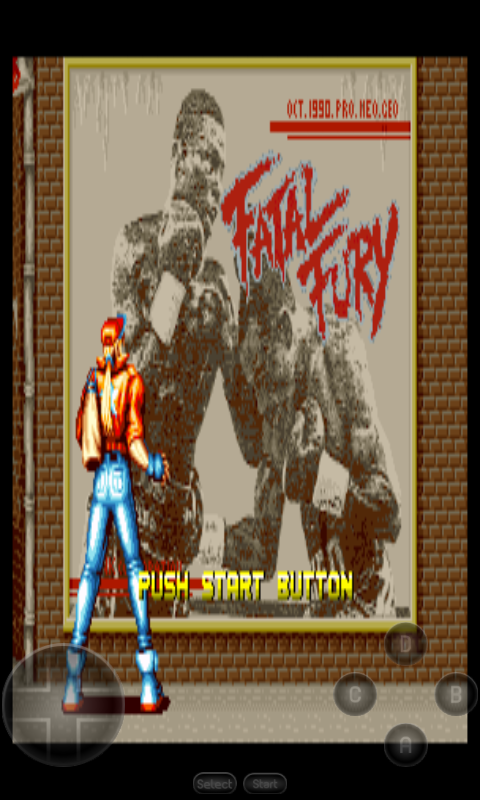 Free Download Games " Fatal Fury - King Of Fighters "
Play Fatal fury Games a Fighting Game in Computer and Android for free. It is a Old Neo Geo Emulator Games. If you are a fan of Emulator Games then you will absolutely love this Game. It is Multiplayer Games, So you can play with your Friend and enjoy together. 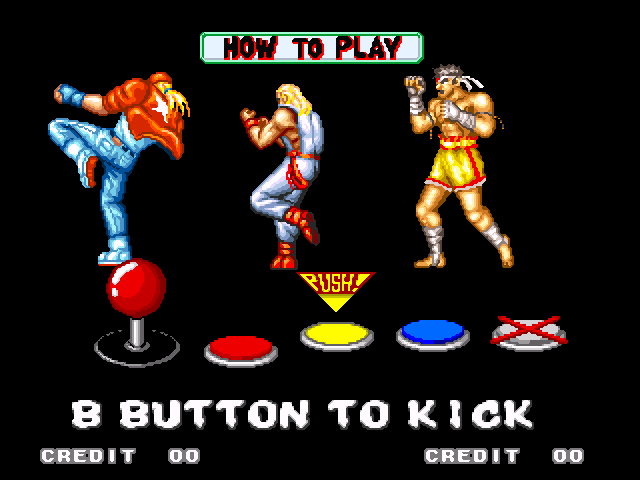 In this Fatal Fury - King Of Fighters Game you can select only one Player from 3 Player. But there is more player which fight against you. At the beginning of the game, the player is asked to select between Terry, Andy and Joe. 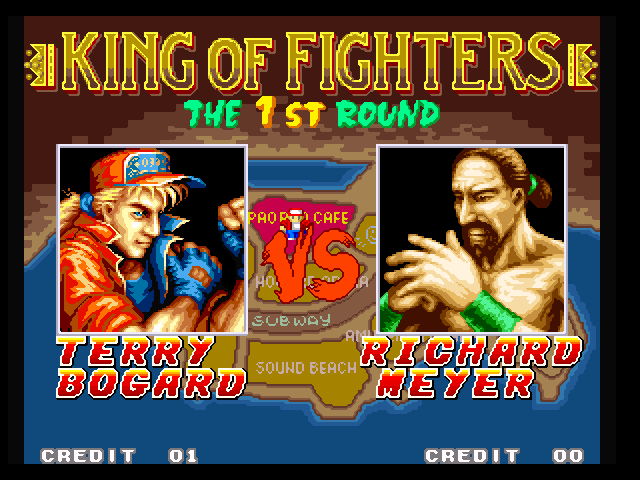 The player is then asked to select from one of four fighters as their first opponent, which are Duck King, Richard Meyer, Michael Max, and Tung Fu Rue. 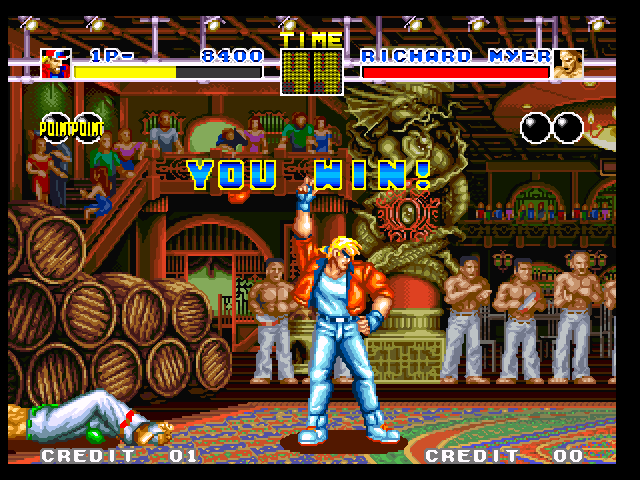 After defeating their first opponent, the player faces the other three opponents in a specific order. The order of the opponents is: Richard, Michael, Duck, Tung, with the cycle beginning at whichever opponent the player has selected. The last three opponents before Geese are fought in the following order: Hwa Jai, Raiden and Billy Kane. Terry Bogard - An American martial arts expert seeking to avenge his father‍ '​s death. Andy Bogard - Terry‍ '​s younger brother, who learned Koppōjutsu in Japan. Joe Higashi - A Japanese Muay Thai expert and a friend to the Bogard brothers. Duck King - A street dancing talent who uses a "rhythmical" martial arts style. Richard Meyer - A capoeira master with numerous kick techniques. Michael Max - A boxer who has a projectile attack called the Tornado Upper (similar to Joe's Hurricane Upper). Tung Fu Rue - A Bājíquán expert. At first he appears as a meek elderly master, but after taking damage he turns into a musclebound beast with a spinning clothesline and a fireball shooting kick. Hwa Jai - A Muay Thai master from Thailand who gains his strength from drinking an unknown liquor. His special technique is a flying knee kick called Dragon Kick, similar to Joe‍ '​s Tiger Kick. Raiden - A heel wrestler who has a poisonous vapor breath technique. Billy Kane - A Bōjutsu master who serves as the tournament's undefeated champion. Geese Howard - The final boss. An underworld crime boss and sponsor of the King of Fighters tournament. After defeating Billy, the player's character is kidnapped by Geese's men and taken to his building, Geese Tower, for the game's final battle. His fighting style is aikido and has a projectile attack similar to Terry's Power Wave called the Reppuken or Violent Wave Fist. He can also throw his opponent after blocking a close range attack (this technique is called Ateminage or Knockdown Blow). 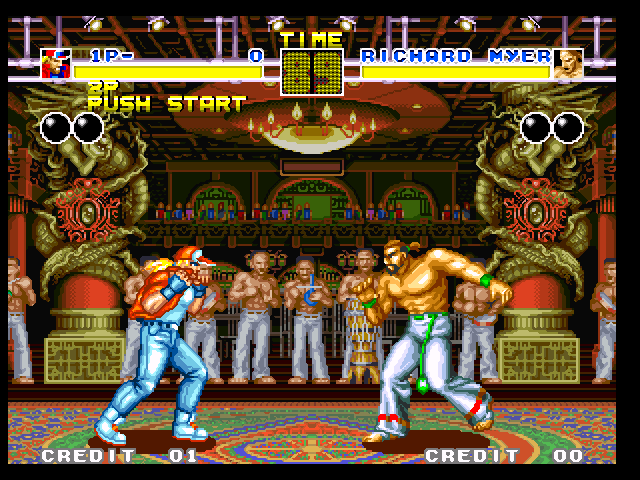 When the player loses to Geese, instead of the standard continue screen, they witness their character falling off from Geese Tower. However, if the player wins, their character will knock off Geese from his building, seemingly killing him. So What do you thinking about Fatal Fury - King Of Fighters ? 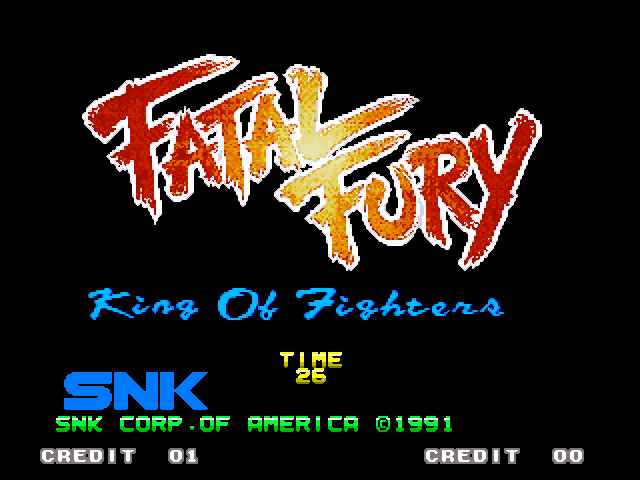 To know more about Fatal Fury - King Of Fighters you may Visit Wikipedia Free Encyclopedia, Search in Google Search Engine and you can visit Developer's Website. Start your Fight, Win the Game. 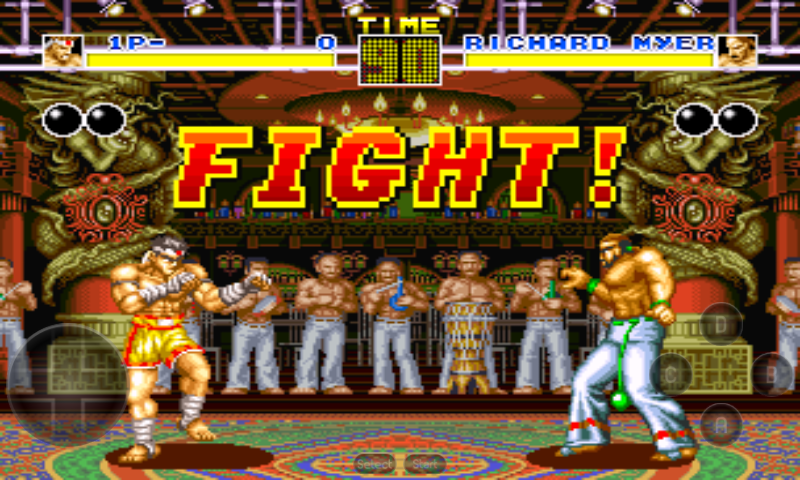 Now Enjoy Fatal Fury - King Of Fighters in your Android with cheat. If you can't download and play the Fatal Fury - King Of Fighters Game in your Computer and Android, also if you can't understand the instruction follow this tow post. Those post is made with Screenshot and You Tube video so you haven't suffer and you will be success.